The Chase is finally framed! I was beginning to think it would never happen! I had no luck finding a framing shop, so I decided to take on the job myself! This is no small job in itself, but it was met with frustration all along the way! First, I had a lot of trouble finding a frame. After months of searching estate sales and thrift stores, I finally found a plain wooden frame. You wouldn't think this would be hard, but it seems like all the frames being made today are either metal, plastic, or laminated with some kind of plastic. I wanted a simple wooden frame. Finally I found an 18" X 24" frame at an estate sale. The frame itself was unremarkable, probably from the late 60's or early 70's. It was the closest in size that I could find, but it was still too big for the sampler. With some persuasion, I got my husband to cut it down for me. He was hesitant to do it, but it turned out very well. 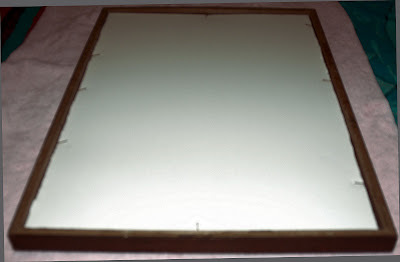 The older frames, unlike the laminated ones of today, cut very easily. Other than a dark stain, it had no finish on it, so I rubbed it with Danish Finishing oil to give it a nice sheen. I had already washed the sampler by adding hot water to Orvus soap, making a lot of suds. I let the temperature cool to luke warm, and then squeezed the suds through the sampler. It was dirtier than I thought with 38 years of dust on it! I rinsed it several times and laid it flat to dry. Before it was completely dry, I ironed it between two pieces of cloth to remove most of the wrinkles. The rest of them came out during the stretching. I decided to use acid-free foam board. It is really not that much more expensive than regular foam board, and truly does make a difference in conservation. First I cut the board about a eighth of an inch smaller than the frame opening in the back. 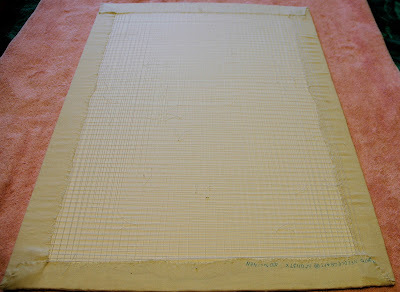 I centered the sampler over the board using pins in the corners and on the sides, moving them as necessary until the sampler was centered. 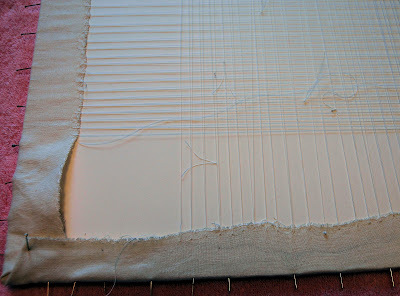 Next, I transferred the pins into the sides of foam, so the sampler could be turned over. 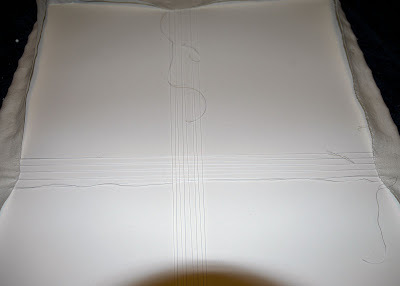 Using cotton thread, I started lacing from the center, working my way out to the edges. I spaced the lacing about 1/4 inch apart. This is fairly tight lacing, and I probably could easily have spaced it about 1/2" apart with good results, but I really didn't want it to move around. The design itself was not stamped evenly on the linen, so I was dealing with unevenness in the design, as well as the linen. I alternated the direction of the lacing so it would not become skewed in one direction. This was a very long, tedious process. I was constantly re-threading the needle. If I cut the thread too long, it invariably become tangled! Slowly, I worked my way to the corners. I just folded the material over, easing the bulk as best I could, and whip-stitched them closed. Finally, I got it all laced and the corners stitched down. When I turned it over it looked reasonably even. Next, I cleaned both sides of the glass with warm water. I laid the frame out on the table and placed the glass it it. Because the sampler should not touch the glass. I needed to make spacers from the acid-free foam board. This actually turned out to be one of the hardest parts. I experimented with various shapes and finally decided that a right-angle shape worked best. I wedged these little pieces of foam-board into the corners. Then, I took the opportunity to remove any remaining cat hairs off the sampler! LOL! It is really best if you can have the cats out of the room while you are doing this! Ha! Good luck with that! Those of you who have cats know what I mean! I have 6 of them! Finally I placed the stretched sampler into the frame and covered it with another piece of acid-free foam board for the backing. 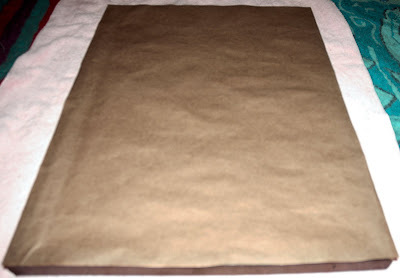 Next, I covered the back of the frame with brown paper to keep the dust out. After the adhesive dried, I attached the eyes and wire for hanging. The only thing left to do now is record the information about the sampler on a piece of paper and attach it to the back of the frame. Erica this is absolutely stunning. Is it true that it has taken you 38 years to stitch (you said 38 years of dust)? It really puts some of my work into prospective when I worry that they are taking a few years to complete. It is worth all the time and effort if you get an end result like this. Thanks for all your kind words about The Chase. It did take a long time to stitch but not quite 38 years! The kit is 38 years old however. I ordered this from a magazine back around 1970-71, something like that. My mother thought this sort of thing was a waste of time and threw it out! Grr! Not an unusual occurance in those days. I was a saver. She was a thrower-outer (if that is a word)! I came home to find it mysteriously gone! Just a couple of years ago I found it in a box at a flea market and was thrilled! I think it only took me about 5 months to stitch (full time stitching, no other projects), but it took me at least that long I think to get it framed! It feels good to have finished it after all these years! All I can say is wow! What a magnificent accomplishment, Erica! Where does it hang? This is indeed a future heirloom, congratulations! I had to laugh when you asked where it hangs! Actually it still doesn't have a home! I am planning to hang in in the hallway upstairs but since that area still needs to be painted, the poor thing still hasn't been hung up! I really won't feel like it is done until it is on the wall! Wow--it looks absolutely amazing. I don't know if I would have wanted to tackle a stamped project, but I might have to rethink that. I know I wouldn't have wanted to tackle the picture-framing. Just wow--how lovely. What a beautiful piece! And what a discovery to find it at a flea market after it had been tossed out! You did a fabulous job. Thank you for sharing all the pictures on how you laced and framed it. What a superb and gorgeous piece of needlework, excellent. I found you on the sampler gallery. Congratulations on finishing the Chase Sampler and framing it. Wow, what an accomplishment! I am working on the Chase Sampler at the present time. 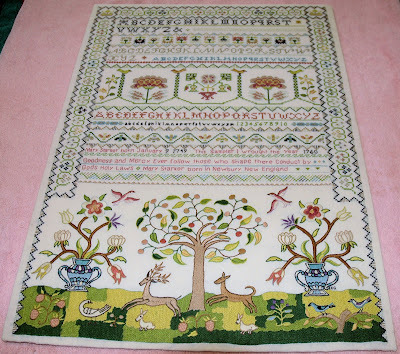 I finally found a Paragon kit on Ebay, I prefer doing counted cross stitch, but just love the Chase Sampler.. I decided against trying to combine the Elsa Williams kit with the Paragon Kit by transferring the pictorial part of the Paragon kit to the counted cross stitch of the Elsa Williams kit.. Thanks for sending me the pictorials though. If I could combine the two I would, but the tracing the design is so intricate. I like natural linen 25-28count and I tried tracing the design with tracing paper. It did'nt work well. it was hardly legible. I recently sent you an email wiith a photo of the room size braided I finished years ago. Haven't heard back from you. Wondering if you received the email. Hope you get this. I have a few questions I'd like to ask you about the Chase sampler. Hi Erica! I was wondering if you still have the instructions for "The Chase" by Paragon? I bought the Stamped Sampler, and the Floss, at an estate sale, but the instructions are missing. Please contact me at marycaudle55@yahoo.com if you would like to sell them. Thanks Very Much! Congratulations on your beautiful Chase. I just found yours, via another blog with a similar sampler which was what I needed to finally name/find this wonderful samplar. 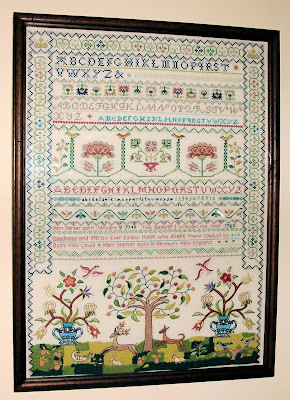 I am lucky enough to have one completed by my mom in 1973. I enjoyed reading about your progress stitching it. My mom gravitated solely to cross stitch (she recently had to lay down her needle -sad- but she did have 36 years of stitching after her Chase). Needless to say cross stitches, framed and waiting to be framed, are more than abundant. There simply aren't enough walls. Out of all her completed pieces The Chase is a cut above and I think it is because of all the other stitching in the bottom scene. You just know the work that went into it. It's sublime!